You would be doing yourself a huge disservice to quickly write off DC Universe Online (DCUO) as another spandex superhero game. Sure, it is that at the basis, but there are some key distinctions that set DCUO apart, making it the next evolution (or mutation) in superhero online games. One can’t even begin to review DCUO without immediately comparing it to the other two superhero MMO games: City of Heroes and Champions Online, so let’s take a quick look at some history. Another Beckett Magazine Cover Story! With the NDA lifted on Cryptic Studios’ latest MMO release early this morning, a lot of fan fare and information begins to trickle through the news in regards to Star Trek Online. I got a chance to sit down and play the latest build of the beta for two hours before the servers crashed, and after a whopping 8 GB download, followed by a 2.5 GB patch, there I was, faced with character selection. For those that do not know, the guys over at Cryptic are the brains behind the original superhero MMO, City of Heroes. Likewise, Cryptic’s latest release, Champions Online, also boasts an amazing character creation system that really allows for any look imaginable. If you are the type of person that likes to fine tune everything from the size of your feet to the width of your jawbone, Cryptic’s games are second to none in this area. When we last left off with our hero, the level 17 Assassin named Sprawl was on a race towards the Abyss. Be sure to read the second part of this two-part Sprawl’s Scrawl feature where we take a look at the final days of Aion closed beta. Take a sneak peak at the Abyss and what you should expect in the ways of PvP come release. If you are new to the IGN Vault exclusive column Sprawl’s Scrawl, Sprawl is the longest running Vault columnist spanning multiple games and over a half of a decade of coverage. 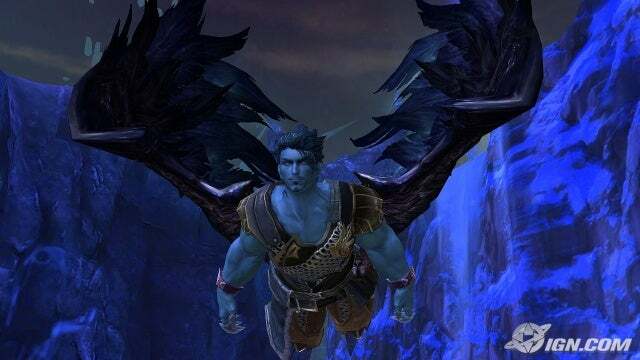 Issues #114 and #115 takes a look at the closed beta of Aion, the Tower of Eternity. Be sure not to miss this WoW Vault and Aion Tower joint-feature.